A customer tells their Account Manager that they have been quoted a DELL XXXX, and asks what HPE has to offer. The Account manager can go into iQuote and open up the Competitive Selector. 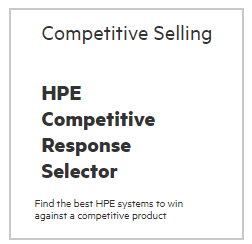 Using the filters such as system type, form factor and product, iQuote can run an intelligent query to browse similar HPE products. The Account Manager will then be given a list of recommended HPE systems.